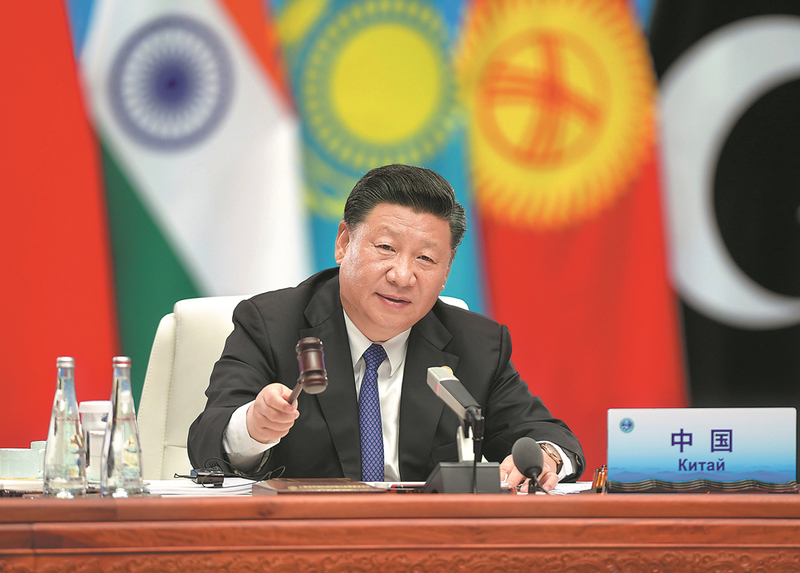 President Xi Jinping called on Sunday for joint efforts with Shanghai Cooperation Organization countries to build an open world economy and reject "self-centered, shortsighted and closed-door policies". Xi made the remark in a speech he delivered at the plenary session of the SCO Summit in Qingdao, Shandong province. "We should uphold WTO rules and support the multilateral trading system so as to build an open world economy," Xi said. He pointed out that while unilateralism, trade protectionism and the backlash against globalization are taking on new forms, the pursuit of cooperation for mutual benefit represents a growing trend. During the meeting, Xi announced a number of major measures to move toward the goal of building an SCO community with a shared future. China will establish a 30 billion yuan ($4.7 billion) equivalent special lending facility within the framework of the Interbank Consortium of the SCO, Xi said. China offers to train 2,000 law enforcement officers for all SCO countries in the next three years to enhance law enforcement capacity building. In addition, China will provide 3,000 training opportunities for the human resources development of SCO member states, Xi said. China offers to provide meteorological services to all parties using its Fengyun 2 weather satellites, Xi added. The SCO has created a new model for regional cooperation and made a new contribution to peace and development in the region, Xi said. He stressed that SCO countries should reform and improve the global governance system, and work with all other nations to build a community with a shared future for mankind. While hegemony still exists in the world, the growing call for a more just and equitable international order must be heeded, Xi said, adding that greater democracy in international relations has become an unstoppable trend of the times. "The 'Shanghai Spirit', transcending outdated concepts such as clash of civilizations Cold War and zero-sum mentality, has opened a new chapter in the history of international relations, and gained increasing endorsement of the international community," Xi said. Over the past 17 years, SCO countries have forged a constructive partnership featuring non-alliance, non-confrontation and not targeting any third party, Xi said. This is the first SCO summit since India and Pakistan became full members of the group last year. SCO members currently account for around 20 percent of the global economy and 40 percent of its population.